It’s just so hard to get now. It’s like finding Pappy Van Winkle, because everyone found out it is the same mashbill. I was only allowed one bottle by my friends at Hokus Pokus. But I can’t complain. They got a single bottle of WhistlePig Boss Hogg and they sold it to me. I got a bottle of Pappy Van Winkle 23 last year from them. In procuring fine whiskey having good relationships is key. I will be writing more about that later. 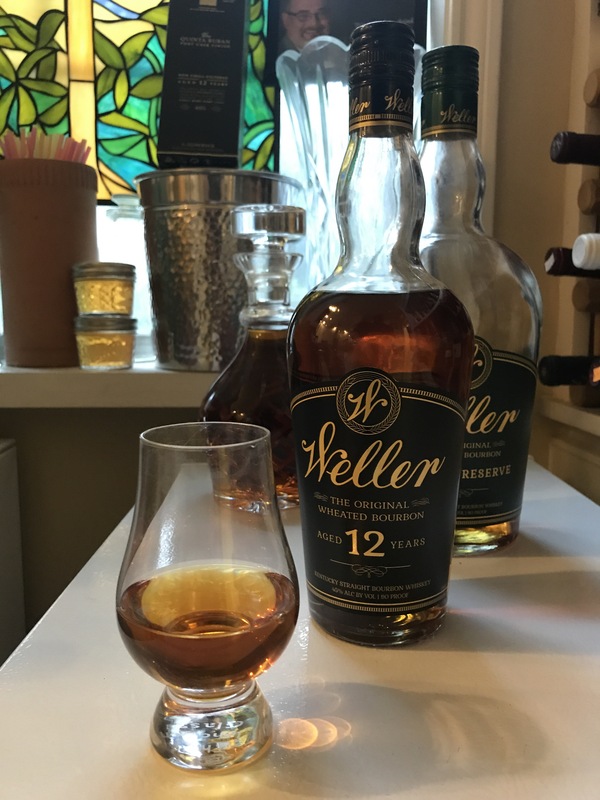 Weller 12 has a very nice and pleasant nose. The thing about wheated Bourbon from Buffalo Trace is that the Spirit they put into the casks is pretty strong, which you can afford to do with a sweet wheated Bourbon. But the cool part about that is that rather than the oak and char dominating the spirit, the whiskey ends up being exceptionally balanced, especially on the nose. The palate is excellent and velvety and is only bested by whiskies in the Van Winkle and Antique Collection bourbons. Caramel chews, cinnamon, and hint of clove and cumin. The finish is nice but has a little bit of phenol that betrays that this whiskey was in the middle racks of the warehouse rather than down below; it has been breathed in and out of the charred wood a bit more heavily than Van Winkle and they have had to add more water to bring it to proof. At $34 dollars a bottle though I sure miss the good old days where I could walk into Hokus and just buy a bottle for a weekend. But thanks to the Pappy craze Weller has been swept up in, it will be years before it will be available like that again. I am glad I can get Green Label again without too many problems. For a few months there I was hoarding cases of 1.75s my wife was able to track down for me for my birthday and Christmas. One final note, if this bottle is like my previous ones it will actually get better as it oxidizes a bit. In a couple of months this whiskey will be even nothing short of awesome, as was the last snort of a bottle I got last year that I allowed myself right after purchasing this one.